I have created an update to an answer I gave when there was no bounty. Now there is a bounty. As you can guess, I want the bounty. Should I update the answer I gave, which I feel might mean I might not get any of the bounty if the OP does not decide to give out any bounty. How can I increase my chances of getting the bounty with my new edit? the highest voted answer created after the bounty started with a minimum score of 2 will be awarded half the bounty amount. My answer got 2 or 3 upvotes pre-bounty. There has been more answers that were given after the bounty started. Here is an answer (might be deleted because it was found to be Not An Answer by the person asking it after we chatted in the comments). Read the comment section as that explains the issue at hand. Vivek gives you the bounty, and you already have 50 from your answer. Total: 100. Vivek gives someone else the bounty or it expires without being awarded, but you already have 50 reputation from your answer. Total: 50. Vivek doesn't give you the bounty, you don't get any upvotes, and the bounty expires without getting awarded. Total: 0. Vivek doesn't award the bounty to anyone, but you get enough upvotes to earn half of it it automatically. Total: probably around 50. Vivek gives you the bounty, but you don't get any upvotes. Total: 50. Vivek awards the bounty to you, and you get a few upvotes. Total: probably around 70. Not the answer you're looking for? 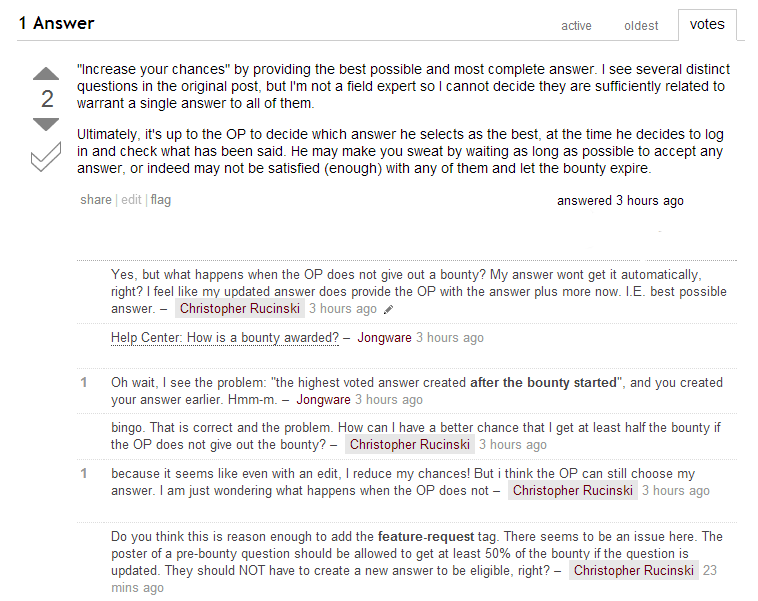 Browse other questions tagged discussion feature-request answers bounty . Why was an answer not awarded a bounty?